The career of Zaha Hadid (1950 – 2016), one of the greatest, truly revolutionary architects of twentieth and twenty first centuries, span a little over thirty-five years. Zaha Hadid’s buildings grace such cities all over the world as Vienna and Innsbruck (Austria), Leipzig, Wolfsurg and Weil am Rhein (Germany), Copenhagen (Denmark), Rome, Salerno and Naples (Italy), Zaragoza (Spain), Abu-Dhabi and Dubai (United Arab Emirates), Beijing, Hong Kong and Guangzhou (China), Baku (Azerbaijan), Seoul (Korea), London and Glashow (UK), and Antwerp (Belgium). In America, she created the Contemporary Arts Center in Cincinnati, Ohio and the currently developed Scorpion Tower (also known as “1000 Museum”) in Miami, Florida – but there had been no Zaha Hadid building in New York City… until recently. Today, one of Zaha Hadid’s final and most beautiful projects – a true eye candy – a residential building located at 520 West 28th Street, adorns the neighborhood of West Chelsea. Together with the planned reconstruction of the 666 5th Avenue skyscraper, this residential building (developed, constructed and managed by Related Companies) will remain one of the only two Zaha Hadid creations in Manhattan. 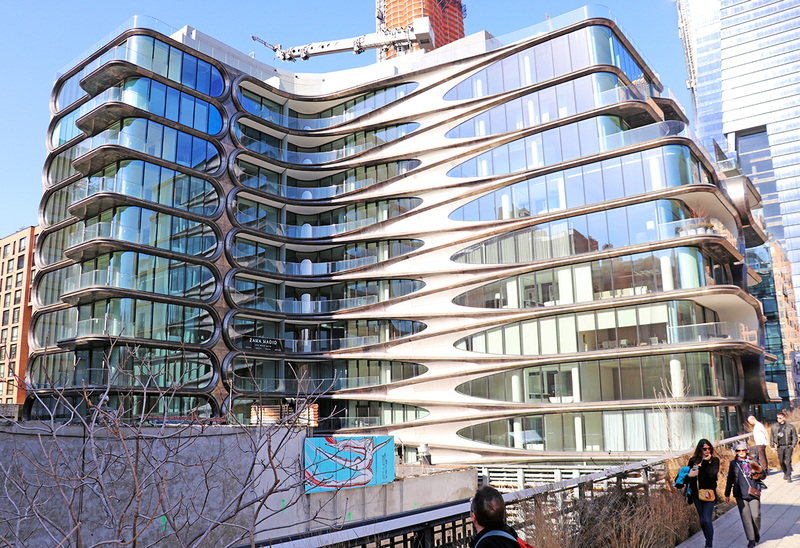 Known simply as Zaha Hadid Building, this relatively small (by Manhattan standards) L-shaped edifice, with its boldly curved organic lines and metal-and-glass façade is simultaneously futuristic and organic – and wildly original. Overlooking arguably the most original public park in Manhattan, the High Line, Zaha Hadid Building includes 39 condominium residences, ranging in size from 1,700 to 6,855 square feet. The largest residence is the triplex penthouse, slightly recessed from the rest of the building, and offering north, east, and south views of Manhattan from a rooftop terrace of 2,000-plus square feet. The building will host 4 art galleries on the street level. The façade is decorated with laser-cut stainless steel by Philadelphia metal works company M. Cohen and Sons. They say that a key trait of any genius is “never repeating oneself”. The work of Zaha Hadid is a perfect example, and her genius and refusal of repetition is very prominently displayed in 520 West 28 Street. Even though every residence is designed within the same flowing, futuristic style, the design of each is entirely unique. 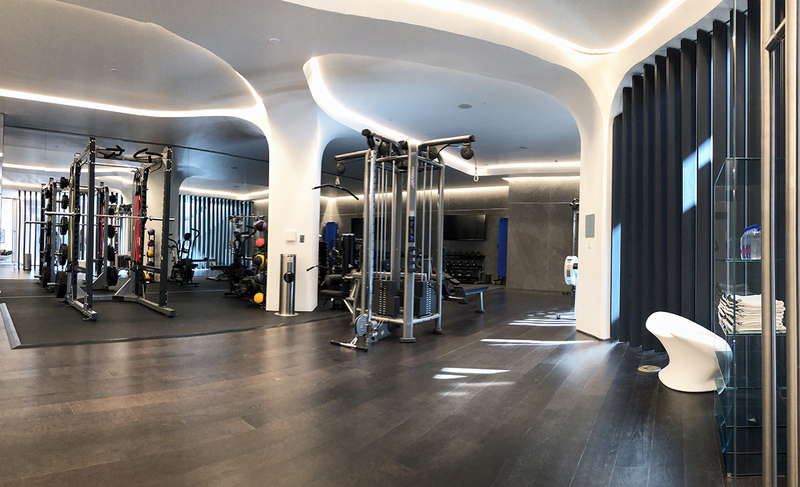 Zaha Hadid has designed every interior personally, and also included and supervised additional design elements created by her talented collaborators Jennifer Post and West Chin. Every residence includes a unique iridescent sculpture custom-designed by Zaha Hadid, emphasizing the elegance of the living space and elevating it to the level of “spiritual luxury”. All floors in residences are decorated with soft, warm wide-plank white oak. Some of the walk-in closets can compete in size with an average Manhattan apartment. Ditto dressing rooms and linen closets. Zaha Hadid designed the kitchens in collaboration with Italian luxury living design firm Boffi (all the functionality of Boffi’s top-of-the-line Xila collection is included) – and kitchen appliances, in collaboration with Gaggenau Hausgeräte. Kitchen isles also include fluidly shaped white marble and specially designed high-gloss millwork. Bathrooms are equipped with smart glass, changing from translucent to fully transparent depending on the light and microclimate conditions. They’re decorated with white marble contrasted with rare Nero Marquinia black marble used for the wall. All bathroom fixtures are by Dornbracht, and freestanding sculptural bathtubs are designed by Teuco Guzzini. In addition to these features, penthouses received extra detailing, custom-designed by Zaha Hadid. 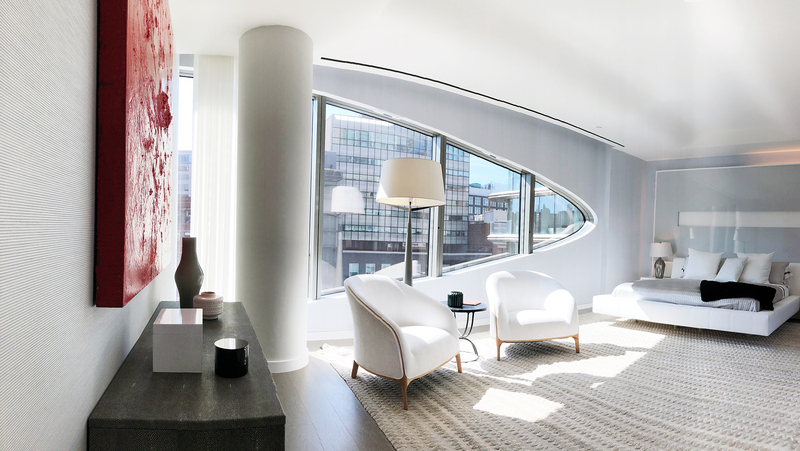 A special feature of the triplex penthouse is a sweeping, futuristic sculptural three-story staircase. Recently I was invited to visit the building, secured the permission to take a few interior photos and share them with my social media followers and blog readers. I hope you like them! You may find it hard to believe the first two are not renderings, but I swear to you they are real photos, taken with a mobile phone! When we speak about the amenities of this building, there are two distinct and important aspects of them that we must cover: that of comfort and convenience – and the artistic side. 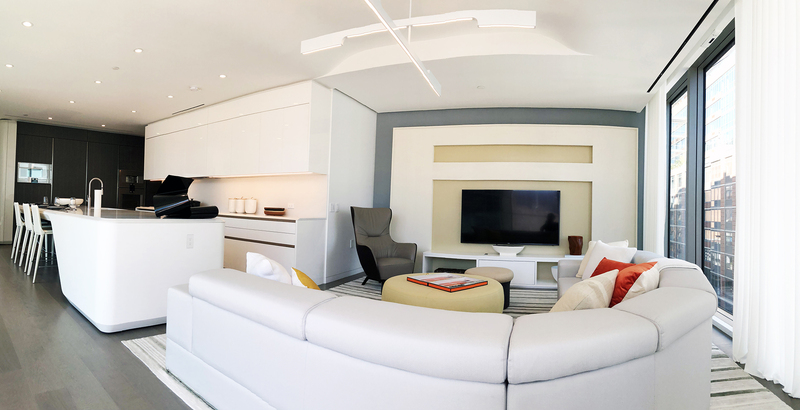 Residents of new development luxury condominium buildings in Manhattan today are spoiled with increasingly decadent levels of comfort offered in every new building. Zaha Hadid building is no exception. It includes a 75-feet saline-system swimming pool, illuminated with natural light through the giant skylight; the reservable private Turkish hammam; the only private IMAX movie theater in Manhattan; a state-of-the-art fitness center, designed by The Wright Fit; the first in New York City robotic storage area (whose design is based on a Swiss bank vault) and a 12-car robotic car parking; state-of-the-art air filtration system; guest lounge and entertainment suite opening to the outdoor terrace – and The Sculpture Deck adjacent to the building, with artwork collection rotating all year round, curated by the nonprofit organization Friends of the High Line. Every resident have access to their designated Luxury Attaché representative who ensures wide array of fully custom concierge services. We may think of all of these items as special – and they are! – but what makes them truly unique is the heart and creative spirit Zaha Hadid infused in every amenity. 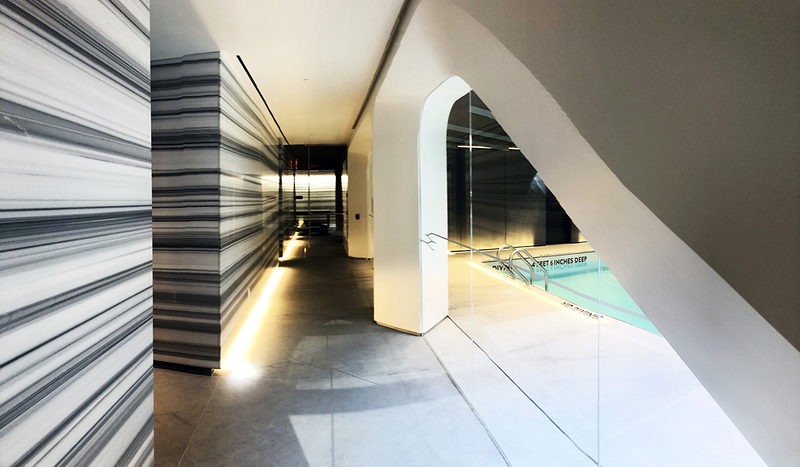 Even though amenities in all new luxury buildings in Manhattan are designed by world-class masters, Zaha Hadid in her penultimate gift to our city left her special magical touch on every element of amenities she personally designed. From the choice of materials, to special attention to subtle transitions between emotional states residents and visitors experience in every area of the building, Zaha Hadid created almost mystical, near-hypnotic experience through architecture that makes a person living here feel confident, calm, morally harmonious and in control of their lives. Children growing up here will probably grow up better rooted in reality – yet with higher goals, and elevated perception of what’s possible. This is the luxury lifestyle at its finest – and if quality of life means something to you, I assure you, a residence in Zaha Hadid building will be a worthy investment. Speaking of the comfort, convenience and quality of life in Zaha Hadid building, we shouldn’t omit such an important topic as neighborhood. West Chelsea is one of the most dynamically developing areas of Manhattan, and it has a lot to offer to local residents! There are over 350 art galleries in this neighborhood, all within walking distance from 520 West 28 street – including such famous artistic institutions as Luhring Augustine Gallery and, of course, Whitney Museum. A new innovative art space, the High Line Nine, is scheduled to open shortly – it will be located directly under the High Line, and will feature not only art, but also food and wine for art lovers. Speaking of food, some of the coolest Manhattan restaurants and watering holes are next door to Zaha Hadid building. If, like me, you enjoy quality food, you will appreciate the range: Cookshop, Toro, Fig & Olive, El Quinto Pino, The Red Cat, Bottino, Morimoto and, last but not list – the huge selection of restaurants, bistros and cafes for every palate at Chelsey Markets! If food for the soul is what you’re after, I’d like to recommend a couple of theaters: British theater Punchdrunk (famous for their Sleep No More show) and William H. Macy’s and David Mamet’s Atlantic Theater Company. Then of course, there’s also The Shed – the new event and artistic space being constructed in the great new neighborhood known as Hudson Yards, just a couple of blocks up north. Also there you will soon find The Vessel – that is a special sculpture / building / park / interactive Christmas tree – an architectural object that defies definition and whose only purpose is fun! The building is framed by two wonderful parks: Hudson River Park on the west and the already mentioned High Line on the east.